Sewers that haven’t been repaired in a long time can pose health hazards as well as cause pollution. And while some people think they have plumbing skills, when it comes to sewer repairs, it’s important to deal with experts such as Austin Plumbing Online as one grave mistake can lead to a nightmare. Traditionally, sewer line repairs have typically been done by use of the “open cut” or trench technique that enables plumbers to get access to the surrounding area that has the damaged piece. Backhoes are usually commonly used to not only open the work area, but to refill the area as well. While the process of sewer repair isn’t easy, attempting to do something that you have no sense of direction with can only have devastating results. That said, it is advisable that when it comes to sewer repairs, you contact the right plumbing company. Of course, yes, there are multiple companies available and ready to take your sewer repair job but are they qualified? A plumbing company that has your best interest at heart will not dig but will first do a risk assessment to determine the gravity of the issue before embarking on a deliverables journey. This is one area that Austin Plumber Online is good at. They have been serving the people of Texas for over a decade now and know the area like the back of their hands. Moreover, they also know the likely cases that need sewer repair and have the best turn around time. 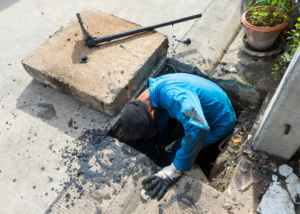 If your sewer needs repair, call them today and schedule a site visit.